Wood Floor can add an aesthetic touch to your Living Space and when you decide to have that look the first thing which comes in your find that how many types of Wooden flooring are available and how to use them in your interior to get maximum of it. There are two types of wood floors available on the market: Solid and engineered wood floors both have their own pros and cons let us read about them in detail mentioned below. Solid wood flooring is made up of solid piece of wood from top to bottom. Its thickness can vary ranges from ¾" to 5/16". Solid wood flooring can be sanded and refinished many times and can be installed above or on grade. 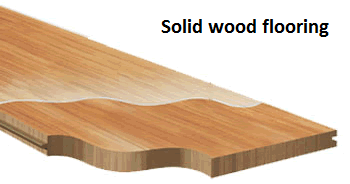 Solid wood flooring can come in various lengths, shapes, dimensions, etc. The boards which are up to 90 mm in width are called as 'strip flooring' whereas boards wider than 90 mm are known as 'plank flooring' and in terms of thickness 18-22 mm thick floors are called solid floors and the thinner 10-15 mm floors as overlays. Where to lay Solid wood flooring: You can lay down the solid wood flooring anywhere. Solid wood flooring is ideal for hallways and living areas where you can show it off. Pros: Solid wood flooring can be sanded and refinished many times so it has good life and looks very beautiful also and can add extra beauty to your interior. Cons: Solid wood flooring is difficult to install or uninstall and little bit costlier than any other wooden flooring. Solid wood swells in damp conditions and shrinks in dry ones. It is not recommended for below grade installations like basements as it has to be nailed or glued for installation. Engineered wood flooring is manufactured using three to nine layers of different wood veneers where sub layers of the flooring can be of the same species or of different species. It has more resistance then the solid wood flooring because the grain of each layer runs in different directions which make it really stable. The top layer of engineered wood flooring consists of high-quality wood. Engineered wood flooring can be installed above, on or below grade. Where to lay Engineered wood flooring: Install the Engineered wood flooring anywhere it won't be exposed to water or a humid atmosphere. Pros: Engineered wood flooring is very stable and less prone to changes caused by a room's temperature or humidity. It looks attractive and cheaper than comparable solid wood planks. 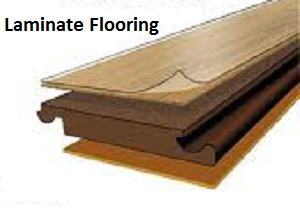 Laminate flooring is not actual wooden flooring, it is a compressed fiberboard plank covered by a photographic image of wood, stone or tile and a protective overlay. It is ideal for Living areas, studies and playrooms. Pros: It looks beautiful, comes in many colors and design. Laminate flooring has a Click-lock design which is easy to install. Cons: Laminate flooring can be easily swollen by moisture and once damage can't be repaired. - Always use a profession wood floor contractor as there are many technical concerns that can adversely affect or compromise the product.